PT PP Urban – PP Urban is a rapid growing general construction company in Indonesia. PP Urban has core business competencies in urban development, construction and precast concrete product. PP Urban engaged in 3 business pillars; PP URBAN Development, PP URBAN Construction, and PP URBAN Precast. 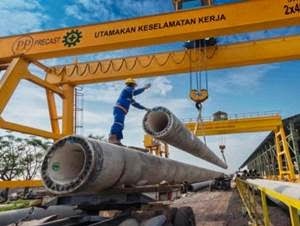 PT PP Urban is a member of state-owned construction giant PT Pembangunan Perumahan (Persero) Tbk or PT PP (Persero) Tbk. As today, 99.99% of its stakes are held by PTPP Group. Headquartered in Jakarta, PP Urban now has 2 factories, located at Serang Banten and Purwakarta West Java. PP Urban’s head office is registered at Plaza PP Lt 2, Jl TB Simatupang No 57 Pasar Rebo, Jakarta Timur 13760. PP Urban holds the ISO 9001, ISO 14011 and OHSAS 18001 certifications for the entire operations. According to information found in PP Urban’s website as cited by JobsCDC.com, PT PP Urban was first established in 1989 as PT Prakarsa Dirga Aneka and initially owned by PT PP (Persero) Tbk Welfare Foundation. In 2008, the company changed its name to PT PP Dirganeka. Later in 2013, PT Dirganeka acquired by PTPP Group and transformed into PT PP Pracetak. The name of PT PP Urban officially launched in 2017. Minimum Bachelor of Architecture Engineering (S1). Strong academic results with GPA ≥ 3,00, preferably graduated from state university (PTN). Required experience as Business Development Officer / Staff in property developer for at least 1 year. Required experience as Architecture Engineer in property developer or architecture consultant for at least 1 year. Minimum Bachelor of Psychology (S1). Required experience as Recruitment and Training Officer for at least 2 years.